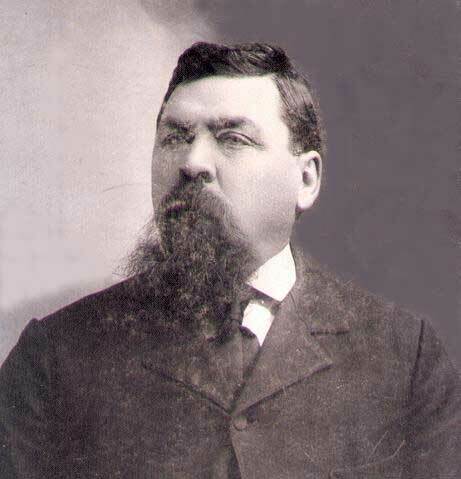 Born: Robinson, IL in 1847. Married: Nancy Hickey in 1868. Emigrated: 1875 -- Probably overland. George Pew Rich was born in Crawford County, Illinois two years before the California Gold Rush. By the time of the 1857 census, his parents, Thomas and Martha, were living in Nemaha County, Kansas. The 1857 census of Nemaha County is online and Thomas Rich is listed. He found and married Nancy Hickey there. Her father, William Hickey, is listed in the same 1857 census as George's father. George and Nancy had 13 children between 1869 and 1895. Ten of them were born after the family arrived in Oregon. Family historians and others are divided on how George brought his family of four (son Urious had died) to the Great Northwest. Some believe the 27-year-old preacher came by ship around the Horn and others believe that he came overland by oxcart rather than the train. But there were a few poorer ones who were still compelled to travel overland on the Oregon Trail. 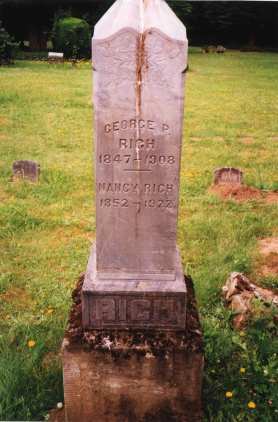 Among the later was Civil War veteran George P. Rich and his wife, Nancy, who lived very close to the trail in Nemaha County, Kansas. -- Page 339. The Oregon Trail is discussed on a Nemaha County Genealogical Society web page. George and Nancy settled in the Kelso area of Clackamas County, near the Mt. Hood Highway. Like John Foster 30 years before, his main focus was on Clackamas County. There are records of his preaching at Damascus, Carver, and Cherryville. More can be learned about these towns at our Clackamas County entry. At one point during his tenure at Damascus, the church reported 60 members, a healthy count for a sparsely populated area. Ten years ago the Church of Christ in western Oregon was in peace and enjoying a good degree of prosperity in numbers at least. Such men as Waller and Bailes had baptized their thousands, and yet they worked at manual labor to support those who were dependent on them. In those days there was unity and love in all the congregations of the disciples of the Lord. It is true the great majority of the elders and teachers were unlearned and ignorant men, outside of the Word of the Lord. But they knew and could and did teach successfully in the face of the most bitter opposition. -- The Pacific Christian Messenger as quoted in Christians on the Oregon Trail, page 364. There is a profile of Mac Waller. As he neared the end of life, George struggled with asthma. This may have curtailed his horseback riding and preaching. It became serious enough that in 1901 he applied for his military pension earned during the Civil War. George ended his earthly labors in 1908 as the result of a cerebral hemorrhage. Nancy continued on another 14 years to enjoy her children and grandchildren. Because George had been a veteran, she was able to receive his military pension. They are buried in the Damascus Pioneer Cemetery at Damascus among their friends and graduated members of the Damascus Church of Christ. Our thanks to Marcus and Corina Kusch for the photo of the headstone.